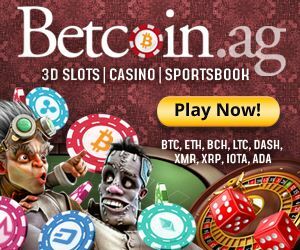 BitcoinRush.io (previously known as casinobitco.in), a leading bitcoin casino and owner of Bit777 and PeerBet, representing the widest array of trusted bitcoin gambling options, is proud to launch it’s first of many exciting new bitcoin Peer-to-Peer games – bitcoin “Gold Rush”. Bitcoin Rush currently offers five traditional provably-fair games, including Blackjack, Video Poker, Hi-Lo, Roulette, and Baccarat, all custom-designed for the site. We were very impressed that each of the games available are unique to BitcoinRush.io and thus result in a unique and enjoyable bitcoin casino experience compared to other flash-based operators. BitcoinRush.io also offers a full BTC sportsbook, including parlays and a variety of sports-based seasonal P2P games and pools such as Superbowl and March Madness squares. As mentioned, BitcoinRush.io is part of a network of well-respected community-driven bitcoin and altcoin casinos including Bit777 and Peerbet, where you can also play games with alternative cryptocurrencies including Litecoin and Peercoin. Gold Rush is an exciting HTML5 provably-fair multiplayer bitcoin game where each player must use immense strategy to outwit their opponent. Each player takes turns selecting a piece of “gold” to risk – ultimately trying to be the first to 32 points. If their piece is larger than their opponents selected for that turn, they take the round. The gameplay is familiar and addictive, and exciting to see in a bitcoin format. We highly recommend new players test-drive the site with the play mode functions on all the casino games. This way, they’re able to see the provably-fair technology themselves and try changing the client seed, which is effectively used to “cut and shuffle” the deck. As can be seen in the screenshot, the graphics are lush, clean, and straight-forward. The large buttons and HTML5 blackjack design allow the game to run perfectly on a mobile or tablet, and are perfect for touchscreen, true casino style gaming! We tested and found no other site to load as quickly or be optimized for mobile in a provably-fair format. 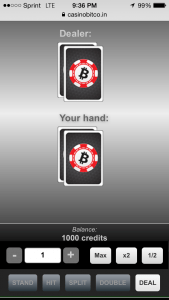 Mobile Bitcoin casino Bitcoin Rush also offers useful transaction history and account information pages, as well as an industry-leading affiliate program. Signing up at Bitcoin Rush is easy and quick, and protected by 2FA at all BitcoinRush.io properties (Including PeerBet and Bit777). 2FA is always recommended as an added layer of protection in case someone obtains your password. BitcoinRush.io always rewards anyone who plays hands of any casino game ending in “-000” and “-0000”. The current reward levels are posted on the free bitcoin promotions page. Other promotions are run from time to time based on sporting and other events. Deposits are near-instant, with many withdrawals being instant unless large or flagged for additional review. We were very pleased with the speed compared to other sites. 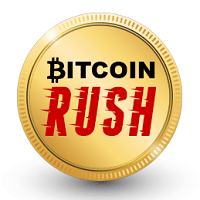 Bitcoin Rush are active participants in the bitcointalk forums and encourage feedback and suggestions. We encourage our loyal readers to check their offerings out, as we’ve been hard pressed to find many other reputable places to play, that we feel we can trust with our bitcoin blackjack bankroll. It’s great to be able to bet on games, and play some blackjack while waiting for the result at the same time. Not to mention, as we love about bitcoin, deposits and withdrawls are usually instant, and all player accounts are anonymous, so once we’re done, we can safely withdraw back our bitcoin wallet.